Our Tri-Clamp® hose fittings are Type 316L Stainless Steel standard and are internally machine polished to a maximum ID surface finish of 20RA prior to Electropolish. 15RA/Electropolish is available for critical process applications. Polypropylene, PVDF and other materials are available by special order. 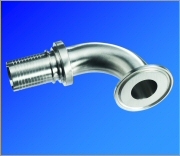 45° Elbow fittings available by special order, please consult us for more information.